2005 DOOSAN-DAEWOO LYNX 220 LC CNC TURNING CENTER, WITH FANUC CONTROL, CHIP CONVEYOR, TAIL STOCK, 12 POSITION TURRET, PARTS CATCHER, 8’’ CHUCK, S/N L2200704. 2001 MIGHTY VIPER VMC-950-AG, 40’’ X 20’’ X 20’’ (XYZ) CNC VMC, CT-40, 21 ATC, WITH MITUSBIHI MAGIG 64 CONTROL, 8000 RPM, 2 SPEED GEAR HEAD, RIGID TAPPING, FULL 4TH AXIS READY AND TROYKI 4TH AXIS ROTARY TABLE, S/N 003196. SMW WORK SWITHCER 4 PALLET MACHINE. 1995 HYUANDAI HIT 8S CNC TURNING CENTER WITH HITROL 840C EZ CONTROL, TURBO CHIP CONVEYOR, 8 STATION TURRET, 15C COLLET NOSE, PARTS CATCHER, S/N 5083. FADAL VMC-4020 CNC VMC, WITH 10,000 RPM, CT-40, 20 ATC, 2 SPEED, 4T AXIS READY, REPLACED ALL BALL SCREWS, W/COMPUTER VERSION 4 SOFTWARE, S/N 8811917. 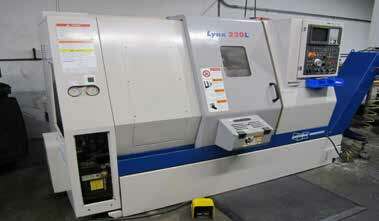 2005 SHARP CNC KNEE MILL WITH PROTO TRAK 2 AXIS CONTROL, VARI SPEED HEAD, MODEL LMV, S/N 0020369. BRIDGEPORT CNC MILL WITH EZ TRAK 3 AXIS CNC CONTROL, VARIABLE SPEED. 1997 SERVO 4 CNC BED MILL WITH SERVO 5000, MECANTECNICA ROTARY TABLE, S/N 970213. FARO ARM SILVER CMM WITH 60’’ CUBE CAPACITY, 18’’ X 24’’ GRANITE TABLE AND WITH ALL NEW UPDATED SOFTWARE AND COMPUTER, S/N S08029600449. IKEGAI 19 ¾’’ X 60’’ ENGINE LATHE WITH DRO. ACRA TURN 13 X 40 ENGINE LATHE. ALLIS CHALMER 5000 LB LPG FORKLIFT LARGE SELECTION OF CARBIDE TOOLING, CUTTERS, COLLETS, END MILLS, TOOLS, VISES. LARGE SELECTION OF INSPECTION TOOLS, MICS, CALIPERS, GAGES AND ETC.